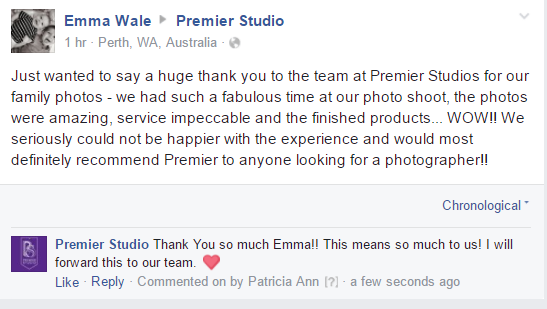 Premier Studio has been creating portraits for 45 years and 3 generations. The techniques and photography knowledge that have been handed to each generation of photographer is what sets us apart. We’ve proudly created countless portraits of families over the years. We want you to have an exceptional portrait experience. From the first call- to when you collect your photos ready to take home. An experience you will tell your friends about. We call it ‘The Premier Experience’. Purpose built full size settings for professional photos just for you. All built on 5 acres of natural australina bushland. We have something for everyone. Premier Studio is located on 5 acres of Natural Australian bushland in Perth. Only 20 minutes South of the City. Choose from multiple different backgrounds for your portrait. Every background has been purpose built and designed just for photoshoots. Here you will experience a personalised photoshoot of your family in a private setting. Our custom designed sets were inspired from iconic Perth locations like the roundhouse in Fremantle, the ‘Outback Australian’ lifestyle, and our love for travelling to other parts of the world. We also have a state-of-the-art indoor studio. You CAN have it all at Premier Studio. We have featured our three favourite backgrounds for you below. Go here to see a complete list of all our backgrounds. Click Gallery to see a range of different photos below of each background. A full-sized Australian Farmhouse is nestled amongst the paperbarks. Created with salvaged timbers, front door and windows at the front but s whole lot more as you walk around her. Browse the gallery now and see the magic come to life. Inspired by our incredible Perth Beaches and love for being outdoors. Your instantly transported to another city at the Egyptian Doors. Be amazed how versatile this set is- from tea party to formal family. We are specialists in making ready to hang wall art for your home. It's Your Family. Made into Art. For your home. All our products are made to Museum Quality. Canvas, Acrylic and Framing are our Wall Art options. Albums finished with Leather covers, Premier Crystals printed on metallic paper mounted onto acrylic glass. Portfolio Boxes with individually matted photos. A Gift range of 8x10" matted photographs are our off-the-wall products. Our specially trained design consultant will spend time with you to design custom made artworks for your home. From off the wall products designed for coffee tables to a stunning complete wall installation, we have something for everyone. Create your perfect family portrait with us. We will direct you and tell you exactly what to do - and we do this everyday! Then decorate your home with original, one of a kind wall art. Click the book now button below to see our online calendar. One of our pre-session stylists will call you to find out who's coming along and personalise your shoot with you over the phone. Whether it be your love of tap dance, the ‘pet’ Harley or a much loved blankie, we want these included in your photos as they are in your life. Our photographers love nothing more than delving into suitcases full of new inspiration! We love hearing from our customers and love seeing their artwork proudly displayed in their homes. It really makes it worth it when we hear we have delighted our customers! If you had your photos done recently - make sure you send us a pic of your finished photos on your wall! We picked up our pictures on Thursday and I finally got our bedroom pictures up. They look fantastic! Thanks so much. The 2nd picture is taken from the doorway. It has really brightened up our room. We are so happy. I am so in love with my photos.. The finished products look amazing!!!! I need to center my table and TV but here it is.. Thank you so so much.. I couldn't have asked for a better shoot or the end products.. I'm so in love with them!! Hi guys, we just wanted to share with you the final hanging location of our two biggest pieces we purchased. The photos in this post don't do them justice. We are yet to have the 3 photos of the kids up against the graffiti wall framed, once we do we will share that also. Thank you for a great experience and a fantastic job capturing our individuality and the true essence of our family. Hi guys - we have finally got them up on the wall. Thanks again for making sure they were perfect. We are very happy with them and everyone who comes to visit loves them. As discussed, I have finally got around to taking photo's of our prints on the walls at home. We are so very happy with them and thank you!